Early this morning, I received a message stating that rising Wantagh senior, Matt Loew, was expected to give a verbal commitment to Hofstra University following the conclusion of the Asics/Vaughan Cadet/Junior National Tournaments, to be contested under the FargoDome, commencing this coming weekend. However, in true breaking news fashion, LHW just learned that the 2009 NYS DI runner-up at 189 pounds had decided to push up the date of the announcement and informed Coach Tom Shifflet and his staff sometime this evening of his decision to stay loyal to his L.I. roots by continuing his bright academic and athletic careers at the Hempstead based institution….Loew becomes the second New York wrestler this week and the third overall to verbally commit to the eight-time Colonial Athletic Association champions. He is joined by 2007 NYS Champion Cody Ruggirello (Valley Central-section IX) who just this past Saturday revealed that he would be uniting with older brother Lou in the Fall of 2010, and two-time defending New York State Champion, Nick Arujau, the #42 ranked recruit in the nation out of Syosset High School. While Matt Loew’s run to the state finals last season may have come as a surprise to some, the truth is that this talented young man has been doing it on and off of the mat for as long as I can recall…As a freshman, Loew came within one win of placing at the Nassau County tournament, competing in a 145 weight class that featured eventual NYS Champion and current HU 149-pound starter, P.J, Gillespie….Building off of his successes as a freshman, there would be no sophomore jinx for Loew as he wrestled his way into the section VIII finals before dropping a hard fought 7-5 decision to Plainedge’s John Makastchian, who later went on to place fifth at the NYS tournament…Despite being denied a wildcat birth into the 2008 NYS tournament, Loew continued to keep his eye on the prize, wrapping up his sophomore campaign by finishing as the runner-up at the NHSCA Sophomore National tournament…It would be performances such as these that would result in the immensely gifted sophomore attracting the attention of schools such as Maryland and Columbia (as per a conversation that I had with Matt’s father Irwin prior to the start of his junior season). 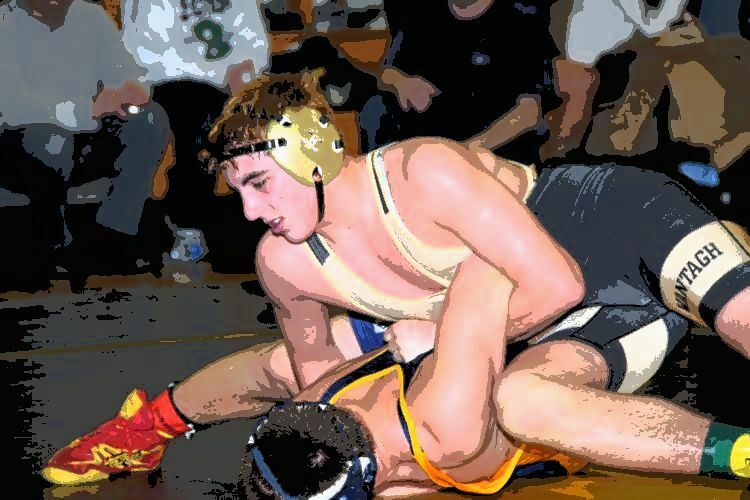 In 2009, Loew was every bit as good, if not better….Securing bonus points in each of his four bouts (three pins and a 21-8 major decision), the Warrior junior cruised to the first county title of his three year scholastic career. But alas, the best was still waiting on the horizon….Pitted against #2 seed Christian Boley (Brockport-Section V), Loew demonstrated superior defensive skills, edging out the 2008 NHSCA Junior National champion by the slimmest of margins, 2-1….A first period pin in his quarterfinal match against section VI’s Ken Hamilton would set up an all-Long Island semifinal match between Loew and Suffolk County Champion, #3 seed Zach Buonaiuto of Miller Place (signed with Edinboro)….Again it would be Loew finding himself on the right side of a win by fall, the slap of the mat coming with 44 seconds remaining in the match….Loew would later become the fourth pin victim of three-time NYS Champion, Austin Meys (headed to Lehigh). But, even in defeat, the 2009 NHSCA Junior National placewinner (6th) showed that he is capable of hanging with the nation’s best. As if his folkstyle accomplishments alone were not enough to convince HU enthusiasts of how special a talent this young man is, I’d be remiss if I did not mention that the kid is quite adept in the international styles as well….Falling one round short of being a cadet All-American in Greco-Roman, Loew displaced the caliber of perseverance found in champions, shaking off the disappointment to finish 4th in the freestyle portion of Fargo’s week long festivities. Projected as a 197 pounder on the collegiate level, the addition of Loew may have been just what the doctor ordered for the Pride…With 2009 starter, Joe Fagiano having transferred to a school closer to home and anticipated 2010 starter, Anthony Tortora entering his final year of NCAA eligibility, 197 pounds was being viewed by several Hofstra fans as one of the weight classes that the coaching staff needed to address during the ongoing recruiting battles for the nation’s elite from the class of 2010…ANSWER MORE THAN FOUND !!! On behalf of everyone at LHW, I congratulate Matt on making his college decision and wish him a happy, healthy, and pressure free senior year…We can’t wait to have as a part of the Lion’s den.